Imagine coming home from a long day at work and relaxing in your backyard next to a pond filled with plants and koi fish. It’s a great way to unwind without having to leave your home. 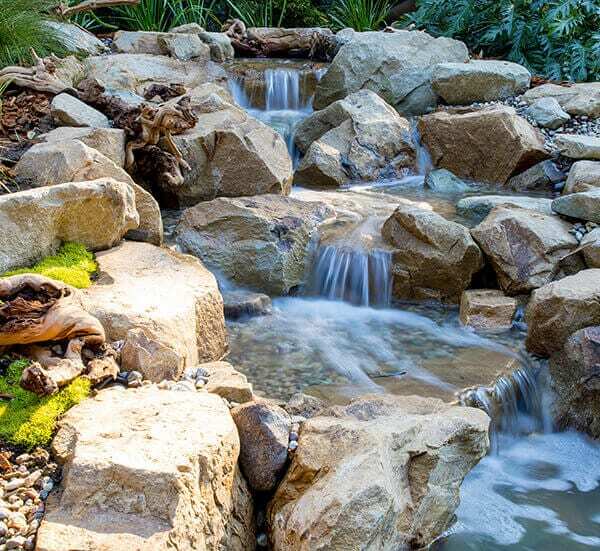 Water features – such as a backyard pond or waterfalls – do more than just enhance the look of your Southern California property. They allow you to enjoy a piece of nature at home and provide calming views even when they are seen from indoors. If you’re like many homeowners in Southern California, there’s a chance you have small children or pets. As a parent, your first priority is to keep your children safe, and you may want to add a water feature, but are worried about the safety risks that a pond could bring. Pets can also negatively interact with a water garden, so proper measures should be taken to minimize damages they could cause. However, by taking the proper precautions, you can still keep your kids safe and have a pond in your backyard. Here are some things to keep in mind when adding a pond to your property. A common misconception is that ponds, especially those with koi, need to be at least several feet deep. And while it’s true that an outdoor pond should be deep enough to accommodate fish, it shouldn’t be so deep that it’s classified as a swimming pool, and thus bearing stiffer regulations. 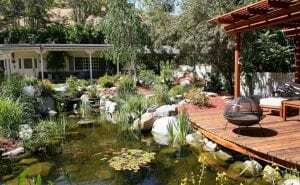 In Southern California, if a pond is deeper than 18 inches, it requires a permit along with a five-foot tall fence around it, with gates that are self-closing and self-latching. Many ponds in Southern California have koi in them. Koi are gentle animals, and it’s fun to feed them and watch them swim through caves – especially if you have children. Because of their docile nature, you won’t have to worry about Koi biting or attacking your children and pets. If you’re worried about your children or pets getting into the pond and touching the fish, the best thing you can do is to add a fence or obstacles around it such as plants or larger rocks. Install a Fence: This is important especially if you have very young children. You can put up a wood fence or use plants to restrict access to your pond. This can be tastefully done so the obstacles doesn’t hide your pond, making them ornamental accents that also serve a valuable function. Whenever you’re building a wood fence, make sure the gate is self-closing, self-latching, and difficult for small children to reach or operate. Position the Pond so it’s Visible From Your Home: Instead of placing your pond in a secluded area of your backyard, put it in a location that’s visible from your home or patio. This allows you to keep an eye on your children (and pets) even if they do manage to sneak away from you. Install a Pool Alarm: Pool alarms sit on top of the water and alert you if something falls into the water or significantly disrupts the surface. Pool alarms shouldn’t be used as your only precautionary measure, and they won’t work well if you have fish in your pond. If you’re thinking about adding a pool alarm, talk to your contractor first to see if it’s a feasible option. Ensure Decorations are Secure: If you add any decorative features, such as statues or rocks, ensure that they’re secure and stable. If children try to climb on top, the last thing you want is for it to fall over because it’s not secured properly. Consider using anchors to secure these features to the ground, or invest in heavier items that can’t easily be knocked over by small children. Add Lighting: Even if you don’t have children, landscape lighting is still a great feature to add when installing a pond or waterfall in your backyard because lights make it safe for anyone who’s in the yard at night. Lighting helps your landscape come to life after sunset. By adding lights inside your pond or waterfall, you’ll be able to capture the movement of the water, which looks stunning at night and draws attention to your water features. Lights can also be added around the edges of your pond, under bridges, on plants and around other areas of your backyard. Consider a Pondless Water Feature: Pondless water features include various types of waterfall and streams, and as the name implies, there’s no pond involved. Pondless water features are only a few inches deep and don’t contain fish, making them a great option for homeowners with small children and pets, or those looking for a water feature with minimal maintenance. The reservoir that holds the water is underground, and then the water is recirculated up to a filter box. This filter box is hidden under rocks and other landscaping so children can’t get into it. If you suspect your pet will disturb fish in your pond, there are lots of great options for water features without fish. However, if you definitely want fish there are a number of things to make sure your pet doesn’t cause problems. Try to discourage pets from getting into ponds or drinking from them. Keep a bowl of clean water somewhere more convenient for your pets so they may be more inclined to drink from those sources. 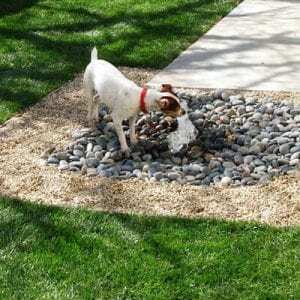 You could even have your pond contractor install a pet fountain nearby, supplied with fresh, cool water for your pup. Try to keep your dog indoors during times you feed fish, as some dogs may try to go after fish food for a snack. Fish food isn’t necessarily bad for your pets, but you want to do whatever you can to keep them from getting in your pond or disturbing your fish. Most pets will safely interact with water features and their fish, but if your pet begins to present too much of a challenge, you may want to consider a pond around your fish pond. Ponds are a great feature to add to your Southern California, but when young children are in the home, it’s important to plan ahead by adding safety features. Children are unpredictable, and the last thing you want is an accident to occur. Your backyard pond can be a relaxing spot for everyone if you think safety first and design second. At California Waterscapes, we frequently work with families that have small children and pets that like to spend time in these areas, and we understand the safety needs you have. Whether you’re looking to add a pond, waterfall or pondless water feature to your home, we’ll answer any questions you have and help you choose the best features that will keep your children and pets safe. We offer design and installation services for ponds, streams, water features and pondless waterfalls. To learn more about how we can help you with your next pond project, check out our gallery and contact us today for a free quote.